As an elementary teacher/media specialist in two elementary buildings, my goal as an educator is to create a learning environment or space that is truly 3-D, one where learners achieve depth perception commonly called deeper learning. It is a daunting goal, and honestly, one that requires extended time - not often available today due to convoluted curricula, which has led to artificial time restraints in order to “cover” standards for high-stakes tests. Self-contained classrooms have given way to departmentalizing in intermediate grades causing content to be taught in silos instead of being integrated. However, with recent emphasis on redefining our goals for education, I am VERY HOPEFUL that as we embrace new pedagogies such as blended learning, personalized learning, and problem/project/inquiry-based learning to achieve our new goals, artificial roadblocks will be removed, creating much needed time for deep learning to occur. Last year, I did extensive research in preparation for building my understanding of the how and why of deep learning and the new pedagogies. I read “New Pedagogies for Deep-Learning” by Michael Fullan and a report entitled, “A Rich Seam: How New Pedagogies Find Deep Learning” by Michael Fullan and Maria Langworthy. I especially like the infographic they created here. I refer to it frequently. I also follow the global website http://www.npdl.global. As a result of my research, to aid in achieving Deep Learning in my 3-D learning space, I knew I needed to reflect upon Design of Instruction and Digital Literacy as well (3Ds). This led me to reading of Digital Reading: What’s Essential in Grades 3-8 by William Bass and Franki Sibberson and to participating in the CyperPD twitter chat group this past summer. The book and the conversation helped me to think more purposefully and explicitly about the “what” that needed to happen in the learning space in order for students to be successful digital readers and writers. What makes places unique and different? Why do people choose to settle in different places? How do humans affect their environments? I curated in a shared document in GAFE a number of thematic maps of the regions of the United States for groups of students to analyze and compare. The following questions guided their thinking. Why do you think geographers decided to divide the United States into 5 regions? What natural characteristics might the geographers have used to help them decide which states to group together in each region? Do you see any connections or similarities between these states? Do the regional divisions make sense? Why or why not? They recorded their thinking and comments in a shared document in Google docs, which we collectively discussed. I then shared with them their task for this inquiry. Research your region from the perspective (point of view) of the three geographers (see below). Create a way to show the economics of your region: production of goods, services offered, jobs unique to the region, population of region. Use the checklist to guide your work. Geographic regions are divided by variations in landforms, climate, and natural resources. Regions vary by natural resources, art, architecture, customs, religion, economics, and transportation. Students chose which region they wanted to study. Teams were formed. Within each team, a team captain was identified. The team captain had the responsibility of leading the group, deciding with the members who would be which geographer as well as which presentation format they wanted to use to share their discoveries. Several students in each class considered themselves experts with the technology tools we were going to use. They were designated as coaches to support others. All three of us teachers provided ongoing feedback to the students through Google docs. Once completed, the team of students shared their regional research with the rest of the class. Feedback from the audience was given. Collectively, the teams created a chart in Google docs to compare and contrast the 5 regions. Teams discussed the differences and similarities among the regions. They also discussed the following questions. Each team shared their thinking. What makes a region in the United States unique and different? How does where a person lives in the United States affect how a person lives? Why do you think people choose to settle in different regions of the United States? How do humans affect their environments? ? As a geographer who understands the unique characteristics of the five regions of the United, you have been asked to take the region you recently studied, and reconfigure/regroup the region in a different way (include other states or take states away). Work with your team members to brainstorm possible solutions and reasons. Select the grouping of states that you think should form this redefined region. In your writing, be sure to express your opinion and support your opinion with evidence for why you think your region should be grouped in this new way. The engagement of the students through this entire inquiry was high. I attribute this to empowering them with choice, voice and the use of technology through an authentic learning experience. Students worked diligently on gathering information from a variety of resources. Students responded well to the feedback they received from us through GAFE. Could have definitely used more time!!! Very challenging when we only had about 40 minutes a day. The worked seemed disjointed at times- we would just be getting into the work when it was time to clean up so they could go to their next class (UGH!). Collaborating and working alongside the classroom teacher and tech teacher is so powerful! We were better able to meet the needs of our learners. Looking forward to weaving the threads of our learning experience throughout this year. Many opportunities lie ahead for connecting new learning to the constructs we have begun to develop as we continue to learn about Ohio within the United States. Will continue to empower students by building their technology toolkit so they can make purposeful choices in how they want to share their understandings as well as empower them to determine who they want their audience to be. 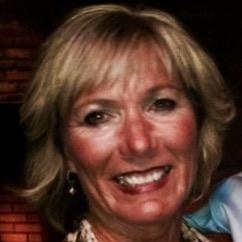 Marsha Pfahl is an elementary educator and media specialist in Hilliard, Ohio. A few months ago, my 4 year old son was engrossed in making a bakery out of play dough. When I, the “customer”, ordered a vanilla crème donut, I was surprised by his response: “We don’t have any of those in the shop, but you can place an order online.” When I was a child, if your imaginary bakery was out of a product, your customer was out of luck, but this is not the case for little ones today. Thanks to technology, the sky is the limit. To us, the tech world is something that has changed our lives in many ways over the years, but to our youngest learners, it is all they know. With this in mind, I knew I had to make incorporating more digital literacy into my kindergarten classroom a priority this year. During the first six weeks of school, I made subtle changes to my classroom practices that I hope will pave the way for digital literacy as a way of life in room 24 throughout the year. ​​This year, I wanted to create an environment that sent the message that we were a digital community. Special areas and nooks designated for reading and writing have always been treasured classroom areas. Students know that reading and writing happen here from day one. It is a given that we can read and write anywhere in the room that we please, but having such cozy little spaces certainly makes it more enticing. So, I decided it was time to devote a piece of our space to a technology nook in hopes of creating the same type of invitation. Bulky computer tables and chairs were removed, and instead, computers are now placed café style atop a high shelf lined with stools, and iPads are easily accessible on a floor-level rack bookended by comfy lounge rockers. The students love this area of the room, and view it as a calming and relaxed space for learning through technology. ​Documenting student learning is one of the most powerful tools for assessment at our disposal. Digital documentation allows for teachers, parents and students to create a footprint that can be viewed and reflected on by the audience of choice in an efficient and timely manner. This year, I have been able to take this to new heights for my young learners, as we started SeeSaw digital portfolios. Seesaw has proved to be very kindergarten and user-friendly, and has a wide-variety of functions. In just a few short weeks, kindergarten students have been able to upload videos and photographs of their work with ease. We are starting small with a goal of just one or two entries per week, but as time progresses, will create increased opportunities for students to share their thinking about reading, showcase their writing, and document any other projects that they feel to be portfolio-worthy. Padlet, Twitter, and our classroom webpage are also easy ways in which young students can document and share their learning throughout the year. ​Daniel used the web, with assistance typing, to find images of the berries that he found on the playground in hopes that he could find out what they were, and determined that they were small crab apples. ​Ben viewed Discovery Channel videos about lizards for his genius hour research. Small moments like these leave a lasting impression on young minds, and taking advantage of and recognizing the value in such simple interactions each day is not to be overlooked. We have only just begun, and still have many emergent reader and writer challenges to overcome. In the meantime, I will continue to support, provide authentic opportunities, give them time and access, model and demonstrate, and always keep in mind that high-quality apps and bookmarks are a teacher of tech-savvy little ones best friends! Adrianna Kruse is a kindergarten teacher, and a fan of teaching our tiniest readers and writers, in Hilliard, Ohio. The magnificent colors in Door County, Wisconsin, need to be experienced. Yes, I can describe them to you. Those of us who have been lucky enough to witness the colors at their peak can share our experiences and our photos… but it cannot replace visiting this place for yourself. The same could be said for learning important lessons about digital citizenship. Yes, as educators, we can describe the importance of taking good care of our digital tattoos. We can teach our students through personal experiences as well as pre-fabricated lessons. But again, experience is the best teacher. My kids are fortunate to each have a Chromebook at their fingertips, to be used both at home and at school. And in the past few weeks, some of my fourth graders have tested the limits and tried out some things that would not fall into the category of “responsible technology use,” especially with a school-issued device. After I got over my initial shock and disappointment, I knew the only way to proceed was to use this as a learning opportunity for all of us. My lesson? I have to be very explicit about what is and isn’t acceptable when using these school-issued devices. But I must take it a step further and address what it means to be responsible when we have our own personal devices, too. Together, our classroom family has taken a step back and reflected on how our actions impact not only those in our classroom, but how our actions impact others outside of our classroom. In today’s world, we have connectivity at our fingertips. Our actions have the potential to reach just about anyone who happens to catch a glimpse of an email, a text, a status update. And just because we “delete” something is no guarantee that it hasn’t been noticed or saved by someone else already. Together, we’ve also learned that not only do we need to be aware of other people’s actions. My kids are now also familiar with the “If you see something, say something” adage. I have to rely on them to help keep each other held to a higher standard than ever before. Let’s keep this conversation going. How do you address digital citizenship in your classroom? In your school? How do we go about involving parents in the conversation? How does the digital citizenship conversation fit in with all of the digital learning that takes place in today’s classrooms? Laura is co-host of the #cyberPD community. She spent the first 18 years of her career working with first graders and now learns alongside fourth graders. She enjoys new challenges and adventures in her both her personal and professional life. When she’s not teaching, reading, or traveling, you’ll find her snuggled up with her two adorable nieces. Today's post, Digital Reading Follow Up, is cross posted, and shared with permission, from Heidi Weber's blog: Learning Links. Heidi's post illustrates not only the way the #cyberPD community works together, but also new steps in this digital literacy journey. One of my big take-aways from #cyberPD and the discussions I continue to have with colleagues about Digital Reading is that digital reading is about engaging in reading through some sort of device. It is about interacting with text on some sort of screen. But it is more than just text; I think of multimedia (audio, video, graphics/illustrations) as part of my reading experience as well. As a reading teacher, decoding text is important, but the construction of meaning is really what reading is all about. Digital reading is not replacing traditional reading of print in my opinion, but rather enhancing or adding to it. Reading skills are the focus. The format through which rich text is accessed can differ. For this reason, I still teach basic comprehension skills and strategies. While I’ve implemented many new ideas (thanks to my #cyberPD friends and Voxer group: @MrsSokolowski, @litlearningzone, @AffinitoLit, @ErikaMVictor, and @LauraKomos), my most recent undertaking is giving my gifted 4th grade readers more options for accessing non-fiction texts. We cherish our classroom Newsstand which currently is home to a large collection of periodicals (Ask, Faces, Cricket, Nat Geo for Kids, National Geographic, Smithsonian, Nat Geo Traveler and others donated here and there). I’ve enhanced this collection by linking content I’ve found online with QR codes and have now started collecting content with a Symbaloo Webmix for students to access. (Digital Reading was created with help from the #cyberPD group and Current Events is something I put together for students containing local Loveland Ohio content as well as great kid friendly sites.) My goal is to help connect my students with current and interesting content whether it be print or digital. Still I wanted a way that my students could interact with digital texts more. They can annotate in print, but being able to highlight and mark on text really helps a reader dive in. Through Google Play for Education I was able to install Chrome add ons for my students: Liner and Page Marker (instructions here). Accessing an article from the digital newsstand resources, I did a screencast video and modeled how to annotate using a close reading strategy I had already taught students for locating main ideas, details, marking questions, and circling unfamiliar or content specific words. (Here are two lessons I did for students using Educreations: Intro to Close Reading and Close Reading Using Iceberg Article). Modeling with these new digital annotating tools, I showed how I went back and re-read an online article from Time for Kids closely to identify these things. Next I demonstrated how to take a screenshot of my annotations and insert it into a Google Document so that I could synthesize my thinking and write a summary of what was important in the text. I also reminded my students how they could look up definitions using the research tool in a Google Document. In this way, my students are able to select current content that interests them, practice close reading strategies and learn/practice skills with technology all at the same time. Digital reading isn’t replacing traditional reading from print… it is just different! How&apos;s it going? 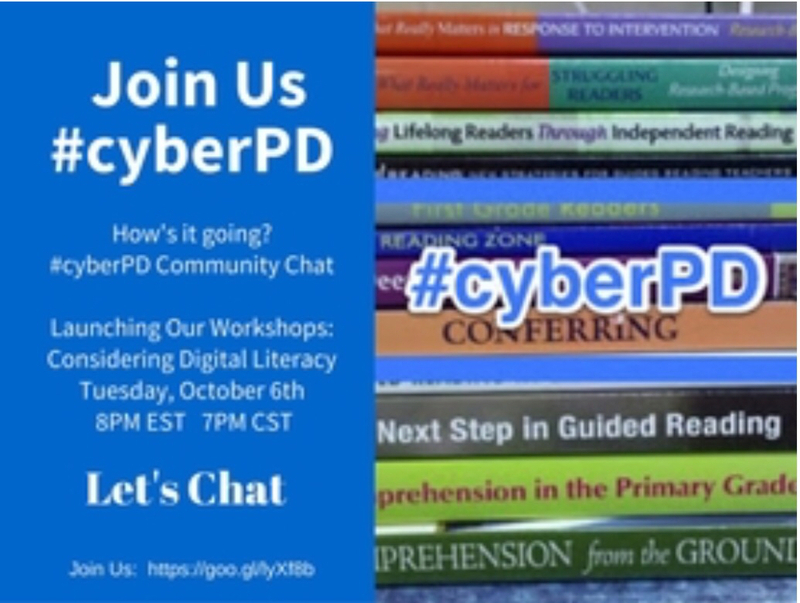 On Tuesday, October 6th, the #cyberPD community hopes you will join us as we talk about launching our workshops with a digital lens. I was supposed to be writing right now about all of our success using www.biblionasium.com as a digital reading record. I was hoping I could tell you about how easy it had been to set up our class accounts, get everyone logged in and start sharing books. I had hoped to tell you how it had changed our class outlook, at least for the time being, on “writing about reading”. And I really wanted to be able to tell you how much my students suddenly love reporting on their reading. I haven’t even taken my class to the computer lab yet for various reasons. We are only in our third week of school, so I don’t feel too terrible about this. Most of my students won’t even be able to sign themselves into the computer since I am going to make them use their personal log-in information this year instead of the generic school log-in. We have but one computer in our classroom, and I swear sometimes it is running on dial-up Internet. I’m expecting to go in anyday and find I am unable to even turn it on. And then there are the iPads. Supposedly, someday, we are going to have 3 assigned to each classroom for my 19 students to share. But someday hasn’t happened yet. I get it. The administrators are busy and since we teachers have been without a contract for over a year, we are currently not participating in a variety of activities as a form of protest. This puts even more on the administrators, pushing “distribution of iPads to classrooms” further down the list. And yet. It would be wrong of me to say that I haven’t changed my teaching this year thanks to our #cyberPD digital reading discussions. I have in my class several students with some serious learning delays and disabilities. I’ve had to really think about how to include them, and keep them busy during the morning literacy block. The aforementioned computer issues have contributed to that dilemma, but during the first week, I put one of them on the computer and logged him into www.bistripsforschools.com, a website where students can make comicstrips. Our discussion this summer helped me realize that this counts as writing. He has to think about the story he wants to create, find appropriate details to add to the cells of each strip, develop characters, and create dialogue. He thinks he’s playing a game. Rather than assigning an adult to spend the whole morning trying desperately to keep him on task, I can just let the other adults in my room at the time help all the other kids! And his writing isn’t anything like anyone else’s, but he’s still going through the steps. He’s even revising! During the first week, I also got another student started on some procedural writing. It’s not what the rest of us are doing, but...I am not really going to say more about that. Suffice it to say, he too is busy going through all the steps: planning out the steps required to make cookies (step 1: open the package of dough), scripting what he wants to say (oral language!) performing each step in order while someone records it on an iPad, and now assembling it into an iMovie video, complete with a title and credits. Yet another student used a video to learn how to make an origami ninja star when the written directions he found in a magazine turned out to be useless. He carefully watched each step, pausing along the way to think, rewatching when necessary, and analyzing what he was doing throughout. Isn’t this exactly what we want out readers to do? So, short story long, I haven’t quite gotten to the thing I wanted to report on. But WOW! Thinking about literacy skills while also thinking of my students as digital citizens has already impacted our classroom greatly. Perhaps soon we will get to the computer lab and set up our Biblionasium accounts, and we will be able to get the iPads into our classroom so we can use all the Padlets full of digital literacy links I have created. For now, I am going to celebrate the changes to my program, and their learning. Lisa Corbett is a member of the #cyberPD community. You can read more from Lisa at A Little of This a Little of That. Today I walked down the hall to pick up J as I had some assessments to complete with her. We were chitchatting about life on the way down the hall when J looked at me excitedly and exclaimed, "My dad made me a shelf last night!" Her eyes glistened. "He did?" I asked. "Where is it? Did he put in your room?" J has talked to me about the books in her house before. "We have books everywhere," she had informed me in one of our first days together. "It's not that kind of shelf," she replied matter-of-factly. "It's on his tablet." "Duh," I thought to myself. I should've seen that coming. Of course, a shelf doesn't have to be a wood bookshelf anymore; it could be a digital bookshelf. "I only have one book on it so far," she continued. "It's really good. It's about a girl who has lost something and you have to read to find out where it is. We're going to add more." You'd think by now I'd be used to these reminders that our literate world is no longer just about paper, pencils, and printed books for our students, but still sometimes it makes me pause. Like J, my literate choices are often digital. These days, my books are mostly on a digital shelf. Each morning before I head out the door I spend a few minutes browsing through Feed.ly for the newest posts. I'm still amazed by the amount of fresh writing available written by practicing educators. I use digital tools in my life to write, to collect ideas, to share with others, to connect and to collaborate. Whether I am snapping a picture to remember a writing idea, downloading books to my digital reader from our library's Overdrive site, or checking my Twitter feed, digital tools have become an integral part of my literate life. For this reason, it always has made sense that I find ways to allow my students to grow their literate lives with digital tools and applications. For me it has never been a question of "why digital literacy." I've known it is essential. Instead I have wrestled more over the "how" of digital literacy with students. How do I create authentic digital opportunities for students? How do I make sure we have the tools we need for digital reading and writing? How do I help students to work with purpose? How do we connect with other learning communities? As I work with educators taking the first steps in a digital transition it's not hard to remember those first days of my own transition. It wasn't easy, but it was worth it. Yet, I realize for many there is still the question of "why digital literacy." It's the world we live in today. If we are not creating digital opportunities we are omitting an important aspect of real literacy for our students. Digital spaces change the community dynamic. Gives students a voice now. Provides more choice to students. Allows me to differentiate for learners. Makes learning more visual for students. Allows me to see inside the thinking of students in new ways. Provides opportunities for students to learn, work, and create in new ways. Makes authenticity and a purpose a real conversation. Connects us to other communities and learners. What are the "whys" that push you to create digital opportunities for learners? How has it made a difference in your learning community? Join us Tuesday, October 6th, at 8 PM EST for our #cyberPD chat. Our community will be talking about launching our workshops with a digital lens. Cathy Mere has taught grades K-6, worked as a literacy coach, and a Reading Recovery teacher in Ohio. Currently she works as a reading specialist supporting young readers. A co-organizer of the #cyberPD community, she supports personalized opportunities for professional learning. Cathy is the author of More Than Guided Reading, and a contributing author for Choice Literacy. She shares her professional reflections at Reflect and Refine: Building a Learning Community and dabbles in poetry and personal essay at Merely Day by Day. Mark your calendars for Tuesday, October 6th at 8 PM EST. We will be hosting our first follow up chat to our #cyberPD discussion around Digital Reading: What's Essential by Franki Sibberson and Bill Bass. Our conversation will focus around launching our workshops considering digital literacy. In July, our #cyberPD community read and discussed Digital Reading: What's Essential. There really aren't words to describe the #cyberPD learning community. This was our fifth year to select a professional title to discuss across blogs, Twitter, and in our Google community. Our reading was divided across the month. Each week participants posted their reflections, as well as took the time to read and comment on the posts of others in the community. (You can read more here: Google Posts, Storify Archives.) It's hard to articulate how much is learned from reading a professional book with this community. The learning is grown exponentially. I'm truly grateful for the ongoing connections established during this event. Now it has been over a month and many of us have headed back to school. As we ended our July study, many of us looked forward to continuing the conversation into the school year. We wanted to support one another as we worked to move toward utilizing digital reading more effectively in our learning communities. For this reason, we're hoping to keep the conversation going. During our time reading and reflecting, we made plans for the new school year. We thought about changes we wanted to make. We considered ideas for making digital reading a more natural part of our workshops. Let's share how it is going. I hope you can join us, Tuesday, October 6th to continue to the conversation. I heard about Voxer about a year ago. Not wanting to miss out, I downloaded the app. I received a notification of a few “friends” that were also on Voxer. And it all stopped there. I had no idea what to do next. Fast forward to spring of this year as Cathy Mere, Laura Komos, and were beginning to discuss #cyberPD plans for the 5th annual summer learning event. It was suggested we try using Voxer to communicate and make plans. Voxer is the best of messaging: live or recorded messages, texts, and attachments. Communicating was quicker and more convenient. Our planning was that much more efficient as well. Through the #cyberPD conversations this past July via our Google Community, blog post reflections, and Twitter chats, Voxer was mentioned again and again as a tool to keep us connected and learning together. During our end of the book study Twitter chat, many teachers were interested in beginning a Voxer group that focused on continuing the #cyberPD discussions. Thus, a #cyberPD 2.0 Voxer group was created. This summer our #cyberPD group read and discussed Digital Reading: What’s Essential by Bill Bass and Franki Sibberson (NCTE, 2015). The authors centered their current thoughts and learning about digital reading around three essential anchors: authenticity, intentionality, and connectedness. I quickly discovered that Voxer is an authentic learning tool that allows me to intentionally push my thinking about digital literacy through connecting with other educators and learners. Bass and Sibberson define authenticity as “keeping reading a meaningful experience that extends beyond the classroom” (p.13). Voxer has allowed us the opportunity to continue discussing our #cyberPD book study in an authentic way. We all responded to the reading through blog post reflections and in the Google Community, but the connection through Voxer pushes us in our thinking to learn beyond the allotted 140 characters on Twitter or the non-interactive comment on a blog. It’s yet another way to communicate, but I believe adds a more personal touch. Hearing a voice (and lots of laughter) is as close to face-to-face as you can get! My #cyberPD 2.0 Voxer group understands the importance of digital literacies and is purposefully planning to share digital texts and tools with our students this next school year. We are able to share our thoughts about collecting and managing resources, creating a “hub” classroom website, and questioning how to go about starting digital portfolios. Our conversations are flexible and shift focus depending on a need, a question, or plain curiosity about a digital text or tool. We intentionally created a safe environment to openly share ideas, links, documents, or to ask questions and seek answers. We didn’t need to set ground rules or expectations, but there is a common respect and understanding that we are intentionally growing in our profession to meet the needs of our learners. Voxer allows us to make intentional decisions about our purposeful planning with the support and clarity that we seek when making changes in our classroom. It’s important to note that we are all in different places in the journey of a balanced digital literacy classroom with varying access to devices. Yet, our #cyberPD Voxer group is a community where we can encourage each other to try something new with a little advice, share a celebration or successful attempt, and support new learning. We are intentionally sharing our decisions about implementing digital texts and tools because we clearly understand the intentionality of each member in the group. I have “met” many amazing educators through #cyberPD. We learned from each other through reflections and comments on a blog post and briefly talked during a Twitter chat. However, we didn’t want the discussion to end and thought there could be more to our discussions. Enter Voxer: A messaging tool that will allow for the continuation of the back-and-forth and give-and-take during a natural conversation. Taking the next step and connecting on a more personal level using Voxer has allowed me the opportunity to feel more connected with a group. We were already connected by reading a common text. We currently share a common goal: learning to embed digital text and tools into our classrooms without feeling overwhelmed! We all have a wealth of knowledge and experience to share to support each other in our learning. Furthermore, sharing our thoughts and ideas provides us with some accountability that we will follow up or follow through with a task or idea. I am always amazed when my learning grows: layer upon layer of deeper and deeper thinking. Voxer has allowed the digital reading conversations to continue and my learning to continue to grow. A special thanks to my #cyberPD 2.0 Voxer group and for continuing the #cyberPD conversations! Free version of Voxer app is sufficient -- so far! 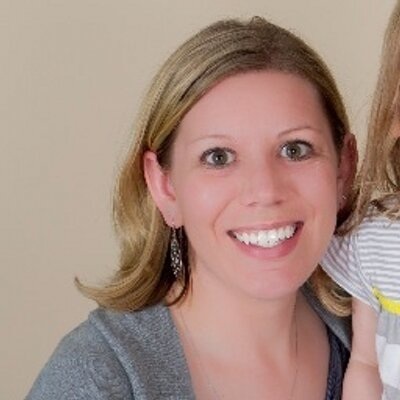 Michelle Nero is an elementary reading specialist in a northwest suburb of Chicago and has been teaching for 15 years. She is passionate about encouraging all readers to find that book to fall in love with reading. Michelle is more importantly the mother of twin daughters, who are excited about starting their school adventures this fall in kindergarten. Michelle shares more of her thoughts on her blog at Literacy Learning Zone and you can connect with her on Twitter at @litlearningzone. She also loves co-hosting the annual #cyberPD learning event ... where the conversations continue! The point of all my summer learning is to walk back into the classroom better than I walked out of it in June, so that my students have more opportunities to succeed.. While there are still many mountains for me to climb in my quest to grow as an educator, I can confidently say I am returning to the classroom with more tools in that proverbial belt and a richer, deeper understanding of the power of technology to enhance learning for my students. Participating in the #cyberPD community has changed my mindset and helped me find new ways to reach my students. It began by reading the book selected by our #cyberPD organizers. The book we studied was Digital Literacy: What’s Essential in Grades 3-8 by William Bass II and Franki Sibberson. We read sections of the book each week and then posted our reflections on our blog, linking to the community. This act alone was powerful for me in understanding how much more engaged and motivated I was to read, knowing I was going to be sharing my ideas and reading other people’s thoughts, too. I was also involved in a group #WabtR (writing about reading) where we read Cynthia Lord’s A Handful of Stars and had to share our thinking in our reading notebook. Once again, I was far more motivated to think deeply and make my notes presentable when I knew I’d actually be sharing them! Take-away: Students need time and space to share their thinking with someone who is going to listen and read what they come up with! When it is all done independently and no one but the teacher “checks” your notebook, the work feels like a chore and “for school” instead of an authentic expression of your learning. Through the weekly #cyberPD blog posts, our Twitter chat, and then joining a small Voxer group to continue the conversation, I’ve changed and adapted plans for the upcoming year, including back to school preparations. Here are some things I’ve done as a direct result of my learning with #cyberPD. New class website: http://sokolowskilearningin215.weebly.com/, inspired by a post from Cathy Mere where she talks about having a “class hub” and the merits of a Weebly site, I decided to try my own Weebly site. I LOVE Weebly and how user-friendly it is, while creating a sophisticated site. I’m incredibly excited to share this with my students and their families. I’m hoping it is site they visit each day and helps keep everyone organized and informed. A Symbaloo as part of the class website, to help students and parents find our favorite places: http://sokolowskilearningin215.weebly.com/important-class-sites.html I had no idea what Symbaloo was or the purpose of it before this summer! I think it is an incredible visual tool and am excited to explore more with Symbaloo. Digital portfolios through Google Drive. I am setting up folders for each of my students and plan to post the photographs I take of them in their digital folder as well as other samples of their work. Thanks to Megan Skogstad for sharing that idea and answering many of my questions about how to set this up! QR codes in the classroom library: As I set up my room, I’m adding QR codes to some of the book displays. For example, on the label that says “Judy Moody”, I’ve added a QR code that takes you to the link to the site where you can learn more about the characters and books. Returning to the idea of recording your voice and then making a QR code, thanks to my Voxer group for helping me come up with the idea to have students explain the different parts and functions of the classroom, recorded via Audioboom. I can then make QR codes to hang in the classroom for those particular sections. For example, students can talk about the classroom library and how it works and this could be recorded. A QR code can be placed near the library. At Back to School Night, parents can walk around the room and use a QR reader to listen to the students describe the important places in our classroom! While I’ve always been interested in learning about technology, prior to being part of #cyberPD, I did see it as mostly an add-on or extra thing, not central to the main learning experience. My thinking has shifted and I understand that, in this digital age, it is a responsibility for teachers to find ways to purposefully use tech tools to enhance reading and writing opportunities for students. Personally and professionally, technology tools have revitalized and changed my life as a reader and writer, so why shouldn’t it be the same for my students? The focus must always be on the learning and how to make it richer, not using a specific “cool” tool that might be irrelevant in a few years. The tools are constantly changing so the goal is not to master one specific tech tool but to envision the possibilities that come from incorporating digital reading and writing into your instruction. Collaboration makes the learning deeper and builds a better community. I’m grateful to the #cyberPD community for inspiring me and helping me return the classroom with more passion, ideas and excitement for the year ahead. Kathleen Neagle Sokolowski is a third grade teacher at Saltzman East Memorial Elementary School in Farmingdale, NY. A married mom to two little tech-savvy kids, Kathleen’s heart is in literacy and helping students see the life-changing power that comes from being more literate. A teacher-consultant for the Long Island Writing Project, Kathleen is also one of the co-authors on The Two Writing Teachers blog. She can be found at http://sokolowskibookbonanza.blogspot.com/ and http://couragedoesnotroar.blogspot.com/. You can follow her on Twitter @MrsSokolowski and her class @Learningin215. In order to continue the conversation around July's discussion of Digital Reading: What's Essential, this site will host guest posts on topics related to digital reading and literacy. If you are interested in submitting contact us at cyberPD11@gmail.com.